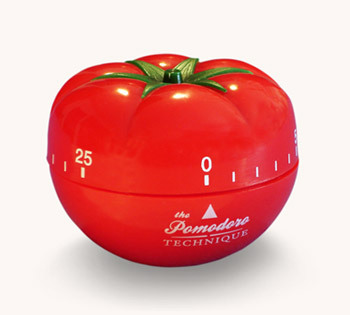 The Pomodoro Technique is something I started reading about when I began doing Agile. It’s all about timeboxing and how it can be used to efficiently manage everyday things by “eliminating the anxiety of time” and “enhancing focus and concentration”. The technique specifically counts time in “Pomodoros” – 25 minute timeboxes in which to concentrate on only one task. There is much more to it including recording distractions, cancelling a Pomodoro when something extremely urgent comes up etc. You can find out more here. I find timeboxing to be a very helpful tool in Agile. Scrum is obviously based on timeboxing iterations, but setting timeboxes can be great for other things, too. I like to timebox certain meetings, especially iteration planning and retrospective meetings. Retrospectives are a great way to get feedback but the team can get stuck on one thing for too long. Similarly with iteration planning the first few stories may end up taking a long time to task out and estimate leaving less time for the other stories. In these situations, I find it best to timebox the specific sections of the meeting. It also helps to improve estimates for how much time and effort something will take by recording the Pomodoros. By timeboxing I don’t mean just setting a time limit but the actual act of setting a timer for that limit. It can be the Pomodoro timer, it can be on a phone, it can be an online stopwatch, but the importance is keeping it visible and sticking to it. The whole point of timeboxing and the Pomodoro Technique is being strict with the time limit and only working on what you’ve set out to do. This can also play into the limiting work in progress philosophy – switching from task to task is counter productive and it takes more time and energy to switch than concentrate on one until it’s done. I also find timeboxing helpful in my personal tasks. I set timers to clean, do school work, even browsing on the internet. It’s amazing how much you can get done when you only concentrate on a single task and ignore all other distractions. Since I’ve started to use timeboxing at work and in my personal life I’ve been more productive and produced higher quality results. I have also gotten better at estimating how long a task will take me to complete. I encourage you to give it a try!